This example modifies the code in Example 1. It shows how BUBBLE statement options control the appearance of bubbles and their labels. It also shows how AXIS statements can modify the plot axes. Create the data set. The data set JOBS contains average salary data for several categories of engineer. 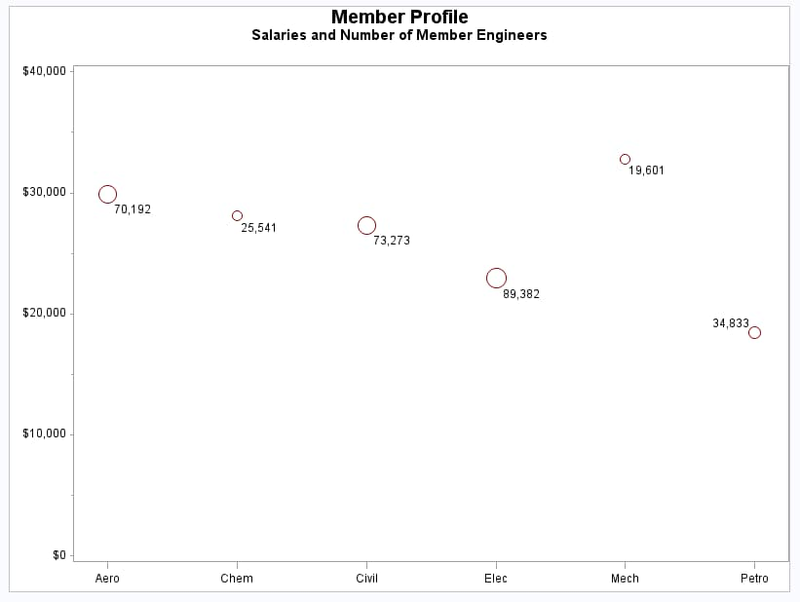 It also indicates the number of engineers in each category. Define axis characteristics. AXIS1 suppresses the horizontal axis label and uses the OFFSET= option to move the first and last major tick mark values away from the vertical axes so that bubbles are not clipped. AXIS2 uses the ORDER= option to set major tick mark intervals. This could be done with the VAXIS= option in the BUBBLE statement, but then you could not suppress the axis label and alter other axis characteristics. Generate bubble plot. The VMINOR= option specifies one minor tick mark for the vertical axis. The BLABEL option labels each bubble with the value of variable NUM. Then BCOLOR= option specifies the color for the bubbles. The BLABEL option labels the bubbles with the value of the third variable, which in this case is the number of engineers in the job category. The BSIZE option specifies the size of the bubbles.